Every box comes with a copy of TinkerZine magazine, which includes articles about that month’s theme, as well as smaller projects and experiments. 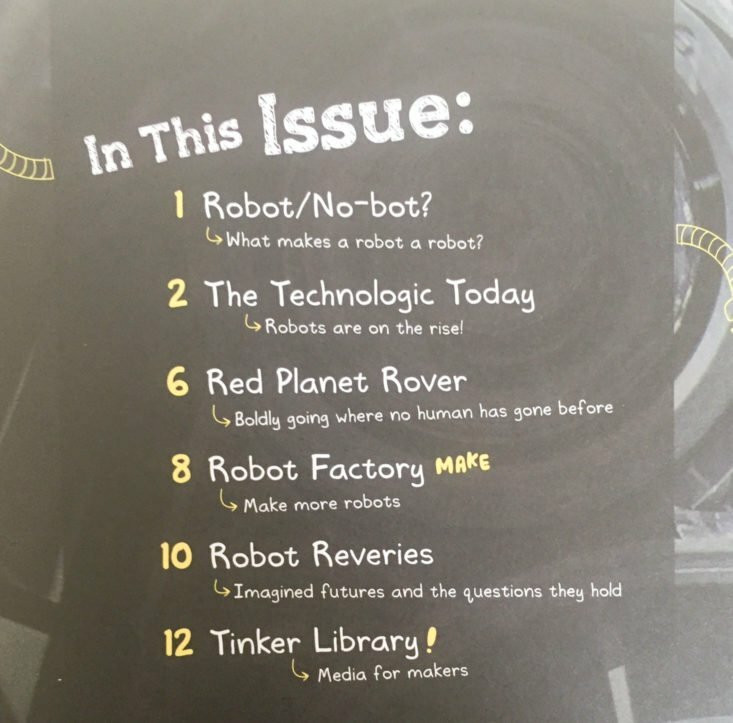 This month’s theme is radical robotics! The kids are always super stoked to build robots. I do this box with my eleven-year-old son usually, but this time my nine-year-old wanted to give it a try! This month’s big project is a walking robot! My son was completely thrilled! My son’s first step was to wrap the cardboard body around the motor and attach it. He also put a dowel through the top and attached gears to either side. He also attached prongs through the bottom and connected them to the motor. His next step was to assemble the battery pack and stick it to the back of the body with sticky foam. He also attached the wires from the battery pack to the motor. His next step was to assemble the arms (with brads) and legs (with plastic tubes and screws). He then attached the arms and legs to the body on the dowel and prongs with foam gears. His final step was to stick the cardboard body panel and head to the body. This is his completed robot! Here it is in action! So cool! We were on vacation with my family when he made this, and everyone was so impressed! The Verdict: We love Tinker Crate! This month’s project was so fun! You really can’t imagine how impressed my nine-year-old was with himself and his ability to create something like this. So exciting! He was really proud to share this with his cousins and the rest of my extended family. I actually don’t know how Tinker Crate comes up with such great project ideas month after month. They also send quality materials and provide loads of educational content. It’s a huge value for $20! Can you still get this box if you sign up today? No, sign up now for the January box.